In 2008 I saw Big Country perform at Legends, Newcastle - Bass player Tony Butler took on the role of lead singer, following the death of original frontman Stuart Adamson. With due resepect, Tony is no singer, but he done the best he could on the night and the fans went home happy. 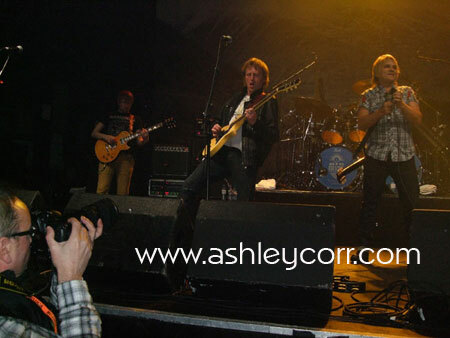 At Legends, back in 2008, the overall sound of Big Country was inevitably hollow due to the 'Missing' guitar parts that Adamson played, but again the band improvised and done a job as well as they possibly could under the circumstances. 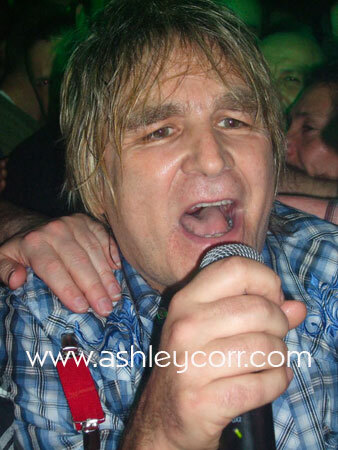 Tonight however was a very different matter, as the band had enlisted the help of Mike Peters (lead vocalist of The Alarm) and used his vocal prowess to compliment the anthemic Big Country sound, and he fitted in perfectly. Not many could have filled the void Stuart Adamson left, but Peters is a worthy successor judging by tonights vocal performance. And remember those 'Missing' guitar parts - well they were back and so was the full BC sound, courtesy of Jamie Watson, son of lead guitarist Bruce. Jamie was earlier drafted in as a kind of experiment after practising Stuart's guitar parts with his dad over a period of months. The band attitude towards a possible inclusion of Bruce's son was 'Let's give it a go and see what happens.' Some may have seen this is a gamble, but if it was, it was one that paid off as Jamie Watson fitted into the live set-up equally as well as Mike Peters - round pegs in round holes! Mike Peters vanishing from the stage, eventually emerging at the rear of house, perched on someones shoulders and singing the 1983 hit 'Chance', much to the pleasure of the surrounding fans. As he made his way to the front of the audience he was helped over the barrier right next to us by security staff. I grabbed a shot of him at close quarters (second shot, above). During one of the encores 'Tracks Of My Tears' Mike Peters altered some of the lines in respect of Stuart Adamson...'Since you left us, if you see me with another band, Looks like I'm having fun. Although I might be cute, I'm just a subsitute, cos you're the permanent one (Mike points skywards). 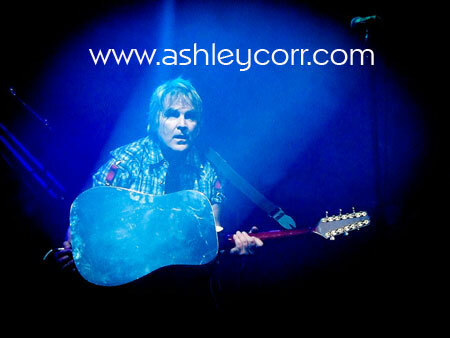 Another highlight (literally) was again centred around frontman Mike Peters as he turned his acoustic guitar to reveal a mirrored back, before pointing it towards the audience and reflecting the light from the rigging above onto the crowd in a 'Search Light' effect. It worked very well, easily reaching the seated audience on the balcony, as well as those at the back of the stalls. I can't remember off hand which song was playing at the time, but it covered atleast two minutes of instrumental as Mike's 'Search Light' flashed past most of the audience. I managed to grab the effect with my humble Fuji, shown here in my third shot. I could ramble on, but I'll be here all night if I do. Enough said then. A great show - looking forward to seeing them again sometime. I hope BC can hang on to Mike Peters though. He's been getting rave reviews on The New Big Country Website for his performances on this tour so far. Bruce Watson, Tony Butler and Mark Brzezicki played their part as usual, leaving their fans with the feeling that there's still plenty left in the tank.